APRIL 2015 ST DONNAN SEMINAR . See below! In 2012, the Society secured Heritage Lottery Funding to investigate the location of the early Christian monastery believed to have been established there by St Donnan c 600 AD. 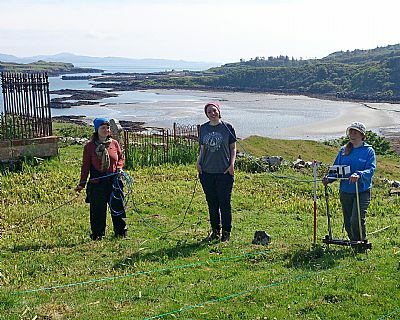 The archeology team led by Professor John Hunter, OBE, of Birmingham University included students from Cranfield and Glasgow Universities as well as local volunteers and Eigg primary school children. Over three weeks in June and July 2012, the team dug and explored several pits and trenches around the site, and finally succeeded in identifying the site of the monastery's oval enclosure, which was located under the Protestant graveyard established in the 18th century. A number of exciting discoveries were also made that have shed new light on the history of the site: foundation of a mortared building, believed to be the original Paroch Kirk, Iron Age/Pictish hut post holes, midden and pottery and in the middle of the graveyard, and a Neolithic collapsed cairn which yieded burnt bone, pottery fragments and a stone tool. Prof Hunter said;" I think it's fair to say that the findings surpassed all our expectations. We now know that that this part of the island was a special place for worship and burial throughout time. We all feel very honoured to have been able to work there." For more details about the excavation, go to http://eiggarchaeology.tumblr.com/. There you will find the blogs of all the people involved in the excavation, and check our Kildonnan project facebook page. 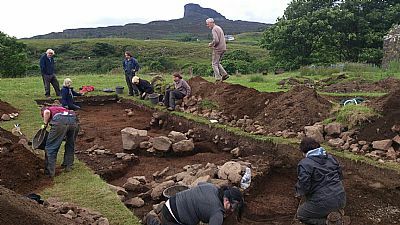 In August 2014, researchers in Ethnomusicology Frances Wilkins, Shane Macleod and Carlos Galan-Diaz came to Eigg to re-enact what funeral rituals would have been like in Prehistoric, Viking and Early Christian times with the help of the island community. The performance was filmed and has been shown in Aberdeen and Stirling before coming to Eigg in April 2015. Here is the reconstruction drawing of St Donnan's monastery that we now have on our interpretation panel and in our leaflet also funded by the Heritage Lottery Fund. The importance of the site for the understanding of the Scottish Early Christian history was stressed in the talks given by Professor Thomas Clancy of Glasgow University and Dr Sally Foster of Stirling University as part of the very successful St Donnan Seminar on 19 and 20 April 2015, and which was also funded by the Heritage Lottery fund. Read Prof Clancy's paper here. 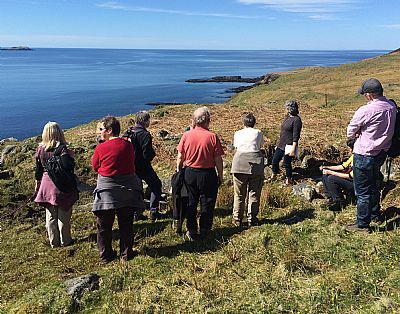 On Sunday 19th, the Seminar started with a guided walk to the Holy wells of Eigg on the south side of the island: St Katherine's well in Galmisdale, and Tobar nan Ban Naoimh, the well of the Holy Woman in Grulin. The weather was utterly glorious and the views to Muc, Coll and Tiree were stunning. Talks took place in the Community hall, where the Funeral Scape team had assembled their panels, which will be in view at the community Learning room , Eigg Primary School, during the summer months. Dr Shane MacLeod explained what the Funeralscape project was about, Dr Frances Wilkins talked about the music which would have been used in funeral rituals in pre-historic, Early Christian and Viking Times, and Dr Calros Galan Diaz discussed the psychological impact of such rituals, using the re-enactment feedback. 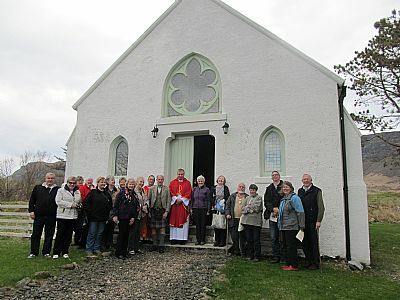 On Monday 20th, a service commemoirating the martyrdom of St Donnan and his companions took place in St Donnan's RC church with members of mainland congregations as far as Lochaline and Glenfinnan and this was followed by a guided tour of the Kildonnan Graveyard and explanation of the dig finds. Coming soon: the link for you to download the Kildonnan App that will guide you to and around the site of the dig. What next: We are now planning to look after our historic graveyard with the help and guidance of Historic Scotland. We are also in the process of "adopting it as a monument" under this Archeology Scotland scheme. We are looking for volunteers to help us map the graveyard and its gravestones. Get in touch if you want to get involved! Donnan, a 7th century Irish saint, brought Christianity to Eigg. The legend is that he went to Iona first to ask Columba to be his Annam Cara,his soul friend or confessor. But Columba gently refused, seeing “the red cloak of martyrdom around him,” and telling him he was destined for sainthood. Donnan came to Eigg and established there a “muinntir”, a small monastic community on the fertile sloping land near Poll nam Partan on the south east side of Eigg. But as foretold by Columba, Donnan and his companions were killed in 617, their death recorded in the Irish Annals. Donnan was also associated in the island folklore with powers over the weather. A new monastery at Kildonnan was eventually founded from Iona and lasted several decades until the Vikings arrived to settle on Eigg in the late 7th century. Several fragments of Early Christian crosses recovered from the Kildonnan graveyard date from that time. most representative scenes on Early-Christian cross slabs tend to run horizontally. 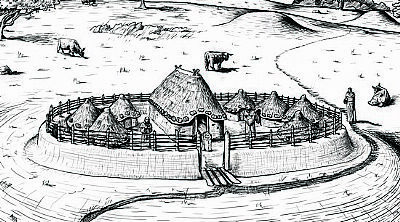 This orientation of the hunting scene suggests that the slab originally had another use, perhaps for a type of shrine structure when the orientation was horizontal. Shrines generally held relics of holy people, saints or saintly rulers. 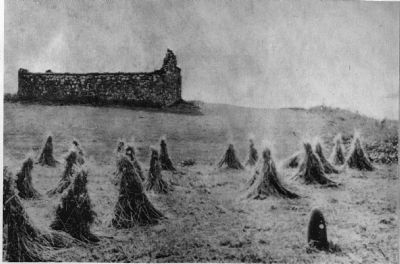 The occurrence of a composite shrine on Eigg matches the high status of the monastic foundation established after Donnan’s death. This monastery came under Iona’s jurisdiction and received Royal patronage in the Early medieval period. The slab would have then been re-used later in the 9th century for an upright cross-slab, probably taking advantage of the plain dressed surface which would have been the inside surface of the shrine, to add the ringed cross and key pattern associated with Pictish royal power. In medieval time, a chapel was built on the site of the monastery as the “Paroch Kirk” of the Small Isle under the Bishopric of the Isles. It was a site of considerable importance in the Clanranald lands, and in 1380, a meeting of all the island chiefs took place there when Ranald of Clan Donald was anointed 2nd Lord of the Isles in the presence of the Bishop of the Isles and seven priests. Disused after the Reformation, the chapel at Kildonnan fell into disrepair and was then used as the Catholic burial ground until the 1920’s. Behind the chapel, an oval shaped boulder can be found. It was believed by the islanders to be St Donnan’s pillow stone, and the area surrounding the stone was never ploughed. Disappointingly, the Kildonnan excavation did not find any trace of the stone basin mentioned by Hugh Mackinnon during its exploration of the area. However it is very possible that the stone may have been moved from its original spot. Today, the 1910 Roman Catholic church built in the Arts and Craft style in Cleadale is dedicated to St Donnan. It features a fine icon of the saint painted in the traditional style by Bulgarian artist George Lomsky. The Early Christian stones found at Kildonnan are also on display there.